Angelo L. Mazzei founded Mazzei Injector Company in 1978 and serves as Chairman/CEO. He is responsible for the strategic direction of the Company and the Company’s vision. He emphasizes providing solutions-based systems and products to our customers. Angelo has been granted sixteen patents in the area of fluid processing and related equipment with emphasis in injection of gases and liquids into water streams and the removal of gases from water. Angelo was also recognized by The American Society of Agricultural Engineers in 2002 with the AE-50 Award as one of the 50 best agricultural related inventions in the United States. He has recently received patents on the injection of air or gases into subsurface irrigation water to significantly increase crop production. Angelo has presented several scientific papers at conferences worldwide. Angelo received his Bachelor of Science degree from California State University at Fresno. He currently serves on several community and professional Boards including Valley Republic Bank of Bakersfield, Kern Agricultural Foundation, The International Center for Water Technology (ICWT), Fresno, CA, California State University, Bakersfield (CSUB) Foundation, and the International Ozone Association. 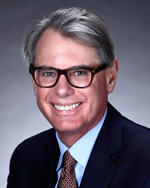 Geoffrey Whynot was named President of Mazzei Injector Company in July 2014. In this capacity, he oversees the day-to-day operations and bottom-line performance of the company. Geoff sets the managerial and operational goals for the company and, under his direction, assures that these goals are met. Geoff joined Mazzei in April 2010 as Chief Financial Office, and in January 2012 his title and duties expanded to include that of Chief Operating Officer. Geoff has an extensive finance and accounting background as CFO in a variety of industries, including manufacturing, technology, construction and communication. His experience includes completion of a number of acquisitions and corporate consolidations, negotiation of numerous financings, creation of a joint venture to develop and market imaging software and the successful implementation of financial restructurings. In addition, Geoff managed the audits of several fortune 500 companies. Geoff received his Bachelor of Science degree in Management from Babson College in Massachusetts, and he is a Certified Public Accountant and a member of the American Institute of Certified Public Accountants. Jim Lauria was named Vice President of Sales and Marketing for Mazzei Injector Company in April 2015. Jim is responsible for the strategic and operational direction of the Company’s sales and marketing efforts. Jim will work with engineering and his sales staff to identify and successfully develop solutions to customers’ water and wastewater needs. Jim has extensive experience in business development and sales in the water and wastewater industry for over 15 years and has held senior positions at a number of companies including Bilfinger Water Technologies and Amiad Water Systems. In addition to this experience, Jim has written features and cover articles for most of the leading water industry publications in the U.S. and many top international magazines. Celia is responsible for the Company’s active Research and Development activities. She is dedicated to the continual growth of the company and leads activities which continually evaluate and implement expanded applications of Mazzei’s products as well as improvements in performance of existing product uses. 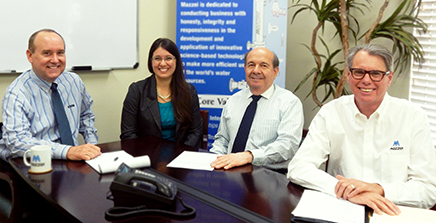 Celia directs the Company’s Computational Fluid Dynamics projects which facilitate new product development and validate existing Mazzei products and systems. Publication and presentation of her research continues to educate audiences of international organizations such as IOA, ICWT and various regional associations. Celia received her Bachelor of Science in Mathematics from Pepperdine University in Malibu, California.